UNITED NATIONS, September 29, 2010 -- As this UN General Debate reaches what some call its garbage time stage, when all the heads of state and attendant security are gone and the General Assembly Hall is largely empty, the deep fissures in the international community become apparent. In a near empty GA on September 28, Sweden delivered a high minded speech, barely mentioning its own country but rather critiquing the human rights records of at least ten countries. The speech followed the more modest plea of Tuvalu, largely devoted to the right of Taiwan to participate in the UN's specialized agencies. A cynical called this Tuvalu “singing for its supper” -- saying what was necessary to keep Taiwanese aid following in, as Burkina Faso also did on Tuesday night. At the end of the proceedings, new GA President and international man of mystery Joseph Deiss -- what are the outside business interests he mentioned but did not disclose? -- opened the floor for the right to reply. Most interventions were predictable. Iran replied to the claims about three islands by the United Arab Emirates, a dispute between oil rich and well armed states which never seems to end. Ethiopia issued a litany of complaint, including on behalf of Djibouti, against Eritrea, which in turn responded that the so called international community never enforced the boundary judgment it won. Then Cuba, moving beyond the parochial, lambasted Sweden's “arrogant” attack on eight states in the Global South (somehow Cuba missed two). Most compellingly, at least to Inner City Press, Cuba said that the Sweden speaker had been asked to stay and hear Cuba's response, but chose not to. Even at the UN this passes for bad form. UN Television panned over to the Swedish set of seat, in which two young staffers sat, looking outgunned. Neither of them chose to surreply. One imagined the Swedish speaker out to dinner, having gravlax and thinking big thoughts. But at the UN you have to engage. Score one for Cuba, on these grounds alone. Watch this site. UNITED NATIONS, September 28, 2010 -- In Darfur, the Joint African Union - UN peacekeeping mission UNAMID is preparing to turn over to the government of Omar al Bashir five supporters of rebel leader Abdel Wahid Nur who have been “accused by Sudanese authorities of having committed crimes,” as shown by UNAMID documents obtained by Inner City Press. For two months the government of Bashir, who has been indicted by the International Criminal Court for war crimes and genocide, has demanded that UNAMID and the UN turn over the five, who “sought refuge in the Community Policing Center of the Kalma Camp for Internally Displaced Persons” after an outburst of violence in the camp. Bashir's government imposed a blockade on the camp, not allowing in food or fuel or medicine, and now seeks to close down the camp. Click here to see Gambari's letter, as obtained exclusively by Inner City Press. So what are the terms under which the UN, Gambari and UNAMID would turn over the five to Bashir's government? Click here to see Gambari's and the UN's Additional Terms, as obtained exclusively by Inner City Press. This in reminiscent of an incident in Geneina, multiply described to Inner City Press, in which UNAMID became involved in and even proposed the payment of “blood money” by IDPs to janjaweed who came into the camp beating up IDPs and demanding money for a person they said had been killed. But Bashir's government has restricted the movement of UNAMID peacekeepers and helicopters, as peacekeepers and civilians as in the Tarabat Market early this money lay dying. The UN's human rights divisions in Sudan have been accused by opposition leaders of failing even to come on a timely basis to examine the body of a slain Darfuri student. To many, this is a new low for the UN: accepting the promise of an indicted war criminal not to kill again as a basis to turn over more of his enemies to him. Watch this site. 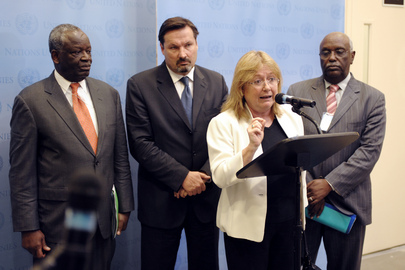 UNITED NATIONS, September 27, 2010 -- Outside the meeting at the UN to address Sudan restrictions on movements and humanitarian access, Sudan's Permanent Representative told Inner City Press that everything was going smoothly inside, no complaints. Upon exiting, the chief of the UN Department of Field Support Susana Malcorra also painted a positive picture. Inner City Press asked about restrictions on the use of helicopters, and about the UNAMID peacekeepers in Darfur not getting to part of Jebal Marra since February, and not getting to the Tarabat Market, where over 50 were killed, earlier this month. UNAMID chief Ibrahim Gambari acknowledged that the response to Tarabat Market had been too slow. But when Inner City Press asked if, going forward, permission from the Sudanese authorities would still be required to move, his answer wasn't clear. 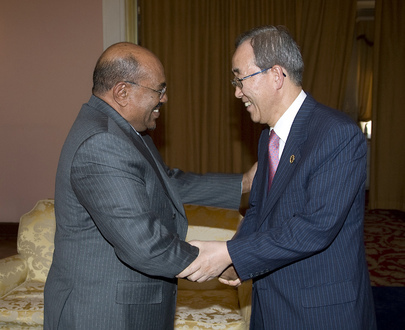 He said that Sudan could still cite security as a basis to move allow movement. UN Humanitarian Coordinator Georg Charpentier talked about a meeting with Sudan's Humanitarian Affairs minister, at which he said access was granted to Jebel Marra. 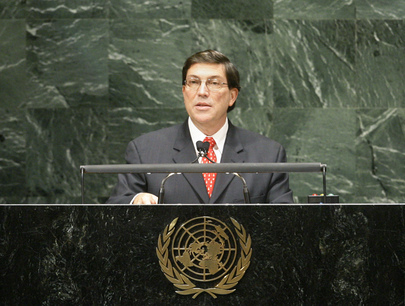 Outgoing UN Humanitarian chief John Holmes had spoken of no access since February 2010. Equally at odds with that other UN officials have told Inner City Press, Charpentier on Monday said on camera that other than joint press releases, he has not shown his press releases to Sudanese authorities. We'll see. 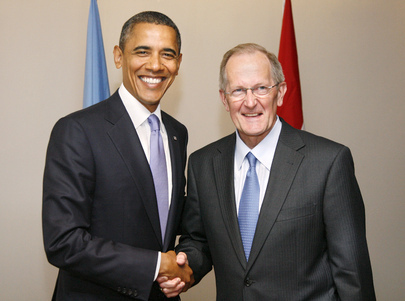 UNITED NATIONS, September 27, 2010 -- The omissions in US President Obama's speech at the UN's Sudan meeting on September 24 were noticed not only by Sudan, whose Vice President Taha praised the new US approach, but also by the wider Organization of the Islamic Conference. “Even President Obama,” Ihsanoglu continued, “did not mention the International Criminal Court” in which speech at the September 24 meeting on Sudan. Inner City Press reported that day on Obama's failure to mention the name of Omar al Bashir, indicted by the ICC for genocide and war crimes. Now the OIC is making much of Obama's failure to mention the ICC, as supporting the OIC's statement of full solidarity with Bashir, and against the indictments. What will Obama or his State Department say? Watch this site. Footnote: beyond Obama's omissions, it has been argued to Inner City Press that the US was behind the opening up the September 24 meeting to the Press and public, against push back from parties unnamed. Openness is all the good - duly noticed.